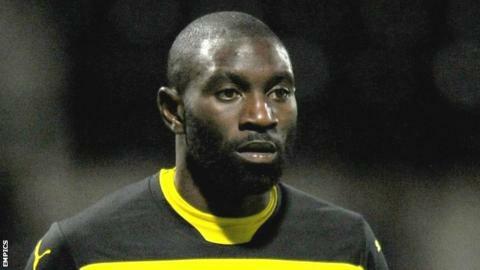 Jabo Ibehre scored a hat-trick as Carlisle United came from behind three times to earn a point in an incredible game against Cambridge United. Barry Corr's header after a slick move and George Taft's strike made it 2-0, but Ibehre's 15-yard shot and powerful header drew the Cumbrians level. Corr ran through to put the Us ahead at half-time before Charlie Wyke's sharp turn and shot made it 3-3. Luke Berry hit a fourth away goal but Ibhere's low strike secured a draw. Match ends, Carlisle United 4, Cambridge United 4. Second Half ends, Carlisle United 4, Cambridge United 4. Attempt blocked. Charlie Wyke (Carlisle United) right footed shot from the centre of the box is blocked. Corner, Cambridge United. Conceded by Michael Raynes. Corner, Cambridge United. Conceded by Kevin Osei. Attempt missed. Luke Berry (Cambridge United) right footed shot from outside the box is close, but misses the top right corner. Substitution, Cambridge United. Greg Taylor replaces Harrison Dunk. Corner, Carlisle United. Conceded by Harrison Dunk. Attempt missed. Jason Kennedy (Carlisle United) header from the centre of the box is close, but misses to the left. Corner, Carlisle United. Conceded by Mark Roberts. Attempt saved. Mark Roberts (Cambridge United) header from the centre of the box is saved in the top right corner. Attempt saved. Daniel Carr (Cambridge United) right footed shot from outside the box is saved in the bottom left corner. Goal! Carlisle United 4, Cambridge United 4. Jabo Ibehre (Carlisle United) right footed shot from outside the box to the bottom left corner. Attempt missed. Jason Kennedy (Carlisle United) right footed shot from the centre of the box is close, but misses to the right. Attempt blocked. Kevin Osei (Carlisle United) right footed shot from outside the box is blocked. Attempt missed. Daniel Carr (Cambridge United) right footed shot from outside the box is close, but misses the top right corner. Attempt missed. Joe Thompson (Carlisle United) right footed shot from outside the box is just a bit too high. Substitution, Cambridge United. Daniel Carr replaces Conor Newton. Joe Thompson (Carlisle United) wins a free kick on the left wing. Substitution, Carlisle United. Angelo Balanta replaces Bastien Héry.